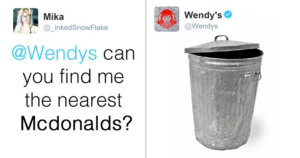 Social media can do a lot for your brand. And if you have a strong strategy, it is probably generating a ton of results for your brand already – many of which you aren’t aware of. If you have a strategy, you should have set a few main objectives that you want to achieve and a few side goals, but the fact of the matter is that even though you are putting all your efforts into achieving your goals and generating results on the metrics you focus on, you are still generating results on the other metrics as well. When you evaluate what social media does for your brand, it’s easy to miss out on results that aren’t within your strategy. And it makes sense. Most marketers only want to see if they have achieved their goals and how well they have achieved it. But this means that you are underestimating the true power of social media because they miss everything else that social is doing for their brand. Are you one of those? There are both results metrics and metrics that indicate success. Marketers also tend to miss out on looking at the results that indicate success because they aren’t specific and they don’t tell you what exactly they do for your brand. But that does not mean they should be ignored completely. Results metrics can be things specific such as “how many purchases have we gotten with the coupon code that we distributed on social media?” and the indicating results can be things like “How many likes do we get on our posts?”. In this article, we’re looking at the variety of metrics that are available for you to measure, so you can see the true power of social media, and what it really is doing for your brand. To make it simple, let’s start with the indicating success metrics. While these aren’t as specific as other metrics, they are often measured due to the fact that they are easily measurable, and the results are clear. These results work more like performance indicators that tell you how well you are doing on social media before anything else. As you’re probably going to see, the indicating metrics are the ones that you normally think of when evaluating results. But to help you get more out of your social media ROI measuring, we’re also going to list metrics that most people normally don’t think about measuring. The “like” metric is a metric that falls into the category of engagement metrics. This will tell you how likely your audience is to interact with you, and how much they are already doing it. In other words, how engaged they are with your brand on social media. This is highly relevant because the more engaged your audience is, the bigger of an opportunity you have to impact them and ultimately sell to them. Your likes will also tell you how well you are getting the word out about your brand. Compared to followers, the like metric can be proof that your audience actually cares about your brand rather than just following you. The comment metric is one of the metrics that truly reflects how engaged your audience is. When someone comments on your post, it’s usually because they are highly engaged in your brand, and find the content you share or the product you feature interesting. Of course, it’s difficult to talk about comments in general, because what truly matters, reflects how well you impact your audience, and how engaged they are, is the nature of the comment. If someone comments a “thumbs up” emoji, it’s not a clear sign that you’ve impacted them deeply. It might be the case – but it’s not very obvious. However, if your audience leaves genuine comments on how awesome you are, and how they love your brand, it is something you should value greatly. Take the time to go through your follower’s comments greatly, and don’t forget to respond to the comments as well. When you go through the comments, you will be able to get a better understanding of how your audience things, and how well of a job you’re doing in marketing to them. Here’s an example from Lindberg eyewear that shows they’ve successfully drawn their potential customer further down the sales funnel, and this can be seen based on the nature of the comment they leave. 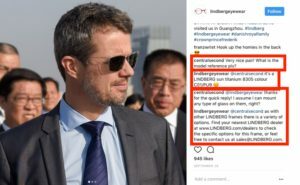 Second, Lindberg eyewear makes sure to respond to their customer inquiries because they know it can have a huge effect whether that person converts or not. Plus, it allows for them to offer their customers great service, and an opportunity to build relationships with them. When they responded, that response evolved into a full-on conversation with their customer. A trust-building conversation that they wouldn’t have if they didn’t respond to the question. The follower count metric is a tricky number to look at. The general idea is that the more followers you have, the better. But that is only true to some extent. You can have endless of followers, but your followers don’t mean anything unless they are engaged in your brand and the things you are sharing. The only benefit of having a large following would be that your brand can look larger than it actually is, and look more trustworthy, but if your engagement rate isn’t in proportion to your followers, it might end up doing the opposite either way. 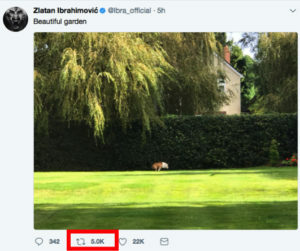 Therefore, when looking at the follower count when evaluating results, you need to look at it with a little skepticism and be able to back it up with information about your engagement as well. When you can say that you have a highly engaged audience and at the same time a large following, you know you are onto something and that you’ve done a good job. When you look at followers, you also want to look at your follower growth. Ideally, your follower count should be growing consistently, because this is a sign that more and more people find your brand and content appealing, making them follow you. When your follower count grows, it also means that you are expanding your audience base, allowing you to impact them over and over. This is a metric worth bringing into the equation, and that’s because it is valuable for brands. Not only the metric itself but more the results that the action gives. On Instagram, it’s more difficult to measure shares simply because there is no share button that tells you the exact number of people who has shared your posts. Since this is the case, it’s better to focus on the other platforms that allow this. Shares don’t necessarily have to be someone who has pressed the share button and reshared your exact post. It can also be things like user-generated content, but this is a metric that falls under the category of “advanced metrics”, so more on that further on. Shares is another metric that tells you how engaged your audience is. In fact, social shares are proof that people are finding value in the content you share – and that’s a good thing. If you, on the other hand, notice that you aren’t getting as many shares as your competitors, it might be a good thing to look over the content you share. It demands more from the viewer to share something from you than to like it. Therefore, social shares is another metric that can give you an indication of how engaged your audience is. Often times, your most loyal followers are the ones that share your content most regularly, and when they do, they are sharing your brand with their peers, thus giving your brand more exposure and reach. Reach is a highly relevant and important metric. The main reason to why you are using social media is to get your brand in front of more people, which also means getting a higher reach. Now you might be thinking “but my goal is to sell more” or “to increase brand awareness” but all of those things are dependent on one thing: that you actually reach people. That’s also why reach is such a good metric, because it tells you exactly how well you are performing on social media – outside of the things like followers and likes because these are only indicators. Reach is cold hard truth. To my surprise, I’ve heard people say that they don’t care about metrics like reach. This is something that I’ve especially seen when brands are going to partner with social media influencers, and it depends on the fact that they want to have something to show for once the campaign is over. They want to be able to say: “We’ve generated X amount of sales”, and this is a safety they want to have when they are evaluating the results. The only problem is that it can lead to efforts being put in the wrong place, and focus ending up on the wrong things. But if the reach is aimed at the right audience, it is a highly valuable metric that shouldn’t be underestimated. For example, when you use Facebook ads, you look at how many people they have been able to reach. In fact, in these cases, reach is often a highly prioritized metric. But when it comes to “organic” social media marketing that doesn’t depend on the integrated advertising tools, then marketing tends to be forgotten among some. Even though these brands in some cases (if they have a strong strategy) gain more reach from their regular social media efforts than they are doing from their ads, but still, they ignore it. The great thing about reach is that it is super easy to view, and it gives you exact numbers that are measurable and evaluate. This is possible with the help of the integrated Analytics tools that most social platforms offer. Here, you’ll get a list of a variety of different metrics (many of which we’ve already discussed), but in the bottom left corner, you can see “Impressions”. This will tell you how many people have seen your post – in other words, the post’s reach. 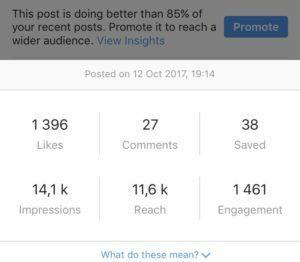 The engagement metrics we’ve now gone through are crucial parts of any successful social media strategy. How your audience reacts to the content you post is highly relevant, because the response you receive helps you determine if your audience is actually interesting in what you are sharing. If the engagement metrics are chirping crickets, then it is vital that you cut the content that is performing badly, and tune your strategy to perfection. Many brands have “increase traffic” as their main objective with social media. And that’s completely fine! Social media can generate tons of targeted and relevant traffic if used in the right way, so why wouldn’t you use it? With the built-in analytics tools on the various platforms, you can see the traffic from each platform, but with the help of Google Analytics, you can measure how much traffic is being referred to your website from the various social channels all at one place. Under the Traffic Sources tab, click ” Referring Sites” and then search for the social network you want to see the referring traffic from. Increasing referral traffic from your social media platforms is a good indication that your social efforts are moving the needle in the right direction. Especially if you have website traffic as your main goal with social media marketing. Now, we’ve covered the basics, that hopefully, you had at least some knowledge about since previously. 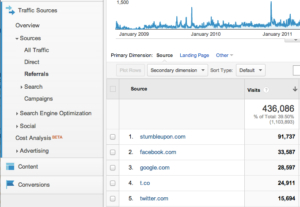 Let’s dig into some more “advanced” metrics, and metrics you might not think about. Mentions are something that is often neglected by marketers, and the most simple explanation is that it is relatively difficult to measure it unless you know how to do it. Mentions basically mean the number of people who have tagged or mentioned you in their post by adding your username to it. Ther are many reasons to why people mention brands, but the most common reason – at least if you’re a brand who is selling products, is because they share a post of the products from your brand. If this is the case, these posts are tremendously valuable testimonials, and most of the people who share these types of posts will be people who praise your company, and this means valuable exposure for your brand. If you have a branded hashtag, then measuring the number of people who use it is an extremely valuable metric. If people have used it, it means that they have gone out of their way to create content (sometimes), included your hashtag, and shared the post on their social platform and the people who follow them. In other words, these are almost 100% of the time highly loyal supporters of your brand who are vastly interested in your brand. And if you have a lot of these people, it means you’ve done a great job in converting them from regular followers to loyal supporters. 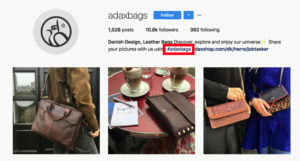 Adax bags has their personalized hasthag clearly visible in their Instagram profile. 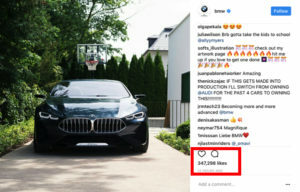 The punchline is: branded hashtag will let you get some type of understanding of how engaged your audience is, and how loyal they are, but it won’t tell you everything they are doing for your brand. User-generated content is usually the two listed above, and often times, they are done at the same time. User-generated content has lots of marketing benefits, and as a brand, you do not want to let the content that is generated by your customers go to waste. Nor do you want to ignore measuring user-generated content, because it means that you’re missing out on a highly valuable metric when evaluating social media’s results. Social media marketing can do a lot for your brand, but unless you are actively measuring the results you are generating through all of the metrics you can, you will never realize just how powerful social media is for your brand. And if you don’t, you might make the foolish move of stopping with social media in the belief that it doesn’t do anything for your brand. Even though that is completely false. Many marketers look at the closest metrics in front of them and ignore to look at all the other ones. Fail to evaluate your social media efforts, and you can be sure to generate bad social media results.